Visual Studio Code>Other>Pack VSIXNew to Visual Studio Code? Get it now. Build your extensions right from the editor itself. A Visual Studio Code extension build and packs extensions for Visual Studio Code right from the editor itself! Currently, only Windows is supported. 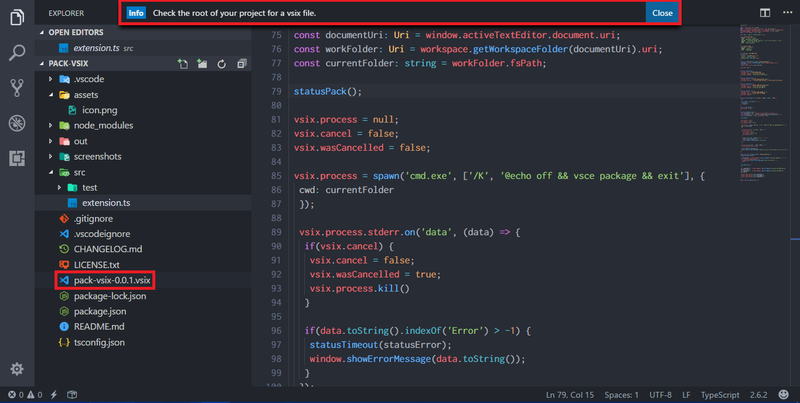 Before proceeding visit the following links, if this is the first time you're creating/publishing a VSCode extension, as you need a configured vsce tool. To activate the extension, open the command palette and choose "Build extension". Check the status of the build in the statusbar. The extension will save the generated extension in your project's root folder.